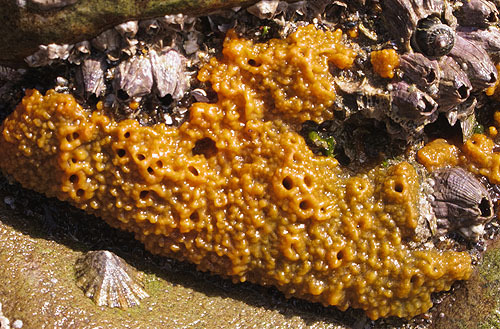 A common encrusting sponge of very variable appearance , forming patches up to 20mm in depth , with raised bumps and striking pores - “volcano like” mounds (Oscula ). Seawater with plankton is aborbed through the tiny pores (Ostia) on the sponges surface , with water and waste exiting through the Oscula . Colour varies - typically olive green , sponges from deep water can be yellow in colour , the surface of thick sponges are greenish with deeper tissues yellow.